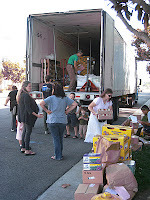 Transition Mar Vista/Venice: Ordering Bulk Food is Fun! Ordering Bulk Food is Fun! Transition Mar Vista/Venice, along with Our Time Bank, participate in a monthly bulk food order from Azure Standard in Oregon. The variety and reasonable price of the natural food selections is impressive—large sacks of various grains, organic spices at prices that are hard to beat, jams, juices, nut butters, pasta, gluten-free products, and teas to mention a few—even some non-food items like essential oils, homeopathics and Seventh Generation toilet paper. A handful of us shared a 25 lb bag of black beans several orders ago. You can browse their website by category or brand (www.azurestandard.com). Once you create an account online, you can sign in and see the prices. Be sure to put a "TB" before your name to indicate that your pickup is part of the Time Bank. You can create a list of Favorites, which makes ordering a breeze. If you don't need enough for the minimum order of $50, add your items to a fellow Transitioner or Time Banker's order. When you check out, choose "Truck Route" as your shipping preference. Indicate drop point #551552. It is the K4 route, and Barbara Berg is our point person. As long as you place your order by the deadline, a semi truck delivers it a week later in Playa del Rey. The Time Bank coordinates a driver to pick it up from there and leave it for pick-up on a member's front porch near Mark Twain Middle School. If you are interested in refrigerated or frozen items, plan to pick up your order directly from the truck—which is a community-building experience in itself!